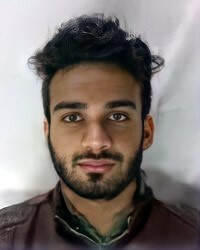 The Rajput Muslims get there name from the larger Rajput people who are one of the four main Hindu divisions of South Asia peoples. Over 60 million Rajput are a core of noble people. Rajput in Sanskrit means, 'son of a ruler or king'. 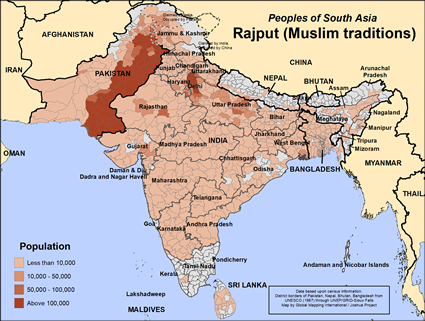 Rajput Muslims constitute about 25 percent of all Rajput peoples in Pakistan, India and Nepal and about 27 percent of all Rajput within Nepal. Legend has it that the Muslim community of Rajput is the descendant of Umrao Singh. Umrao had fought against a conquering Muslim ruler over the death of the ruler's son. However after his release, Umrao was never restored to his Hindu Rajput community and as an outcast, formed his own Muslim Rajput community. Today the Rajput Muslim people are primarily an agricultural community. The Rajputs are traditionally the landowners in Nepal. As land has been lost, a growing number have become employed in service and even wage labour jobs. Women can often be found in weaving, embroidery and the making of handkerchiefs. For women, toe-rings, nose-pins and glass bangles are common symbols for being married. They are non-vegetarian though avoid beef and enjoy foods like wheat, rice and pulses. They are Sunni Muslims but with much influence by Hindu traditions they retain a variety of Hindu practices. As people of influence and social status, the Rajputs are a key people to reach with the Gospel. As converts to Islam they may be more open than many traditionally Muslim peoples to hear and receive of the love of Christ. Praise God that some Hindu Rajput have become believers but there are no known believers among the Muslim Rajput. View Rajput (Muslim traditions) in all countries.